Avios and American Express have come together to launch a new partnership with the upmarket men’s clothing retailer Hackett. When I was first told about this, six months ago, it was meant to be a similar partnership to the Charles Tyrwhitt one. I’m not sure what has changed, but the deal is now restricted to British Airways American Express cardholders as opposed to anyone with an Avios account. On the ‘Offers’ tab of your British Airways American Express card online statement page, you will find the Hackett offer. Click ‘Save to Card’. Once you’ve done that, you will earn 25 Avios per £1 spent on your BA Amex at Hackett until 28th April. 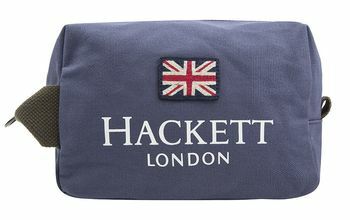 The offers work in stand-alone Hackett stores – but not department store concessions or outlet stores – and you can also buy on the Hackett website here. Le Club AccorHotels has launched a credit card-based programme to encourage you to eat and drink in its bars and restaurants. The deal has an interesting structure which could be a template for further deals. All you need to do is ensure that the credit card in your Le Club AccorHotels profile is a Visa card. To make life complicated, if the card in your profile is ALREADY a Visa card, you must delete it and add it back! After that, you will automatically earn Le Club AccorHotels points at the rate of 1 per €1 (whoah, a whole 2% rebate!) at the bars and restaurants on this page when you pay with the same Visa card. There is only one good reason to do this. The points SHOULD reset the expiry date of your Le Club AccorHotels account. Whilst technically you need a stay every 12 months to keep your points alive, historically any earning activity on your account has done the job. There just weren’t many ways of creating activity without a stay before this! Full details including the list of participating venues are on the Accor website here. The offer runs to 31st May and is only for UK-based Accor members. Finally, if you’re looking for somewhere funky-ish for your next trip to New York, the latest EDITION hotel has just opened in Times Square. Full details are here. The location may, de facto, make you write it off before you even see it. I can’t blame you. However, I have been very impressed by the class and style of two EDITION hotels I have toured (I’ve never spent the night in one). 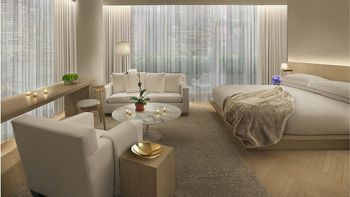 If you used to stay in a W hotel but can’t stand the pace any longer, EDITION is for you. As a Marriott Bonvoy redemption you’re looking at 60,000 points per night. If you’re paying cash, don’t forget to factor in $35 per night of ‘resort fees’ – although you get a $35 food and beverage credit in return – plus taxes, to the price you see online. The Times Square EDITION page of mariott.com is here. OT – bookings still AWOL from BA.com. I hope they don’t disappear from the app as well or check in is going to be a pain! Do reward flights booked via Iberia Plus have the same flexibility as BA reward flights? only those booked on Iberia and maybe BA but not other partners. When you choose a reward flight it does let you see the difference between fares and their cancellation terms. I think some let you reschedule/cancel for free (but require more Avios when booking) and others charge you EUR 25. Not on partners. Yes on BA and IB. O/T: If I wanted to buy cheap insurance, say for 6 months, say for no more than £2.50 a month, would I want to insure my pet or my life? Struggling to get it below £5 a month at present. Harry maybe? Start with £10k life for mortgage over 10y, that should do it. Got me x2 for little over a £1 each. Well an awful lot of people’s pets only seemed to survive about 6 months during one period a few years ago. Poor things you just never know when pet insurance is worth taking out. Will need to check DD, I am sure one is £1.34 or £2.34 and the other was cheaper still, and I’m older than you. Currently got 4x LI on the go thanks to you Harry but I need to be more disciplined on payment and cancellation dates. However, truth to tell they are so cheap I’m tempted just to let them run. Are you still able to buy UK only basic travel insurance for the “purpose”? Is this an Avios deal? Care to share? I guess we’ve all got the AerClub email this morning, ‘Pay with Avios.’….I’m guessing it’s not at all a good deal. I did and I would also guess not. O/T – If a car rental company doesn’t take amex, would i still be covered under the Amex platinum charge card car hire insurance? Althought this was last minute in London as my lease came to an unexpected end and have a few weeks to wait until my new car arrives! Thought the car rental cover was only when on holidays? You don’t need to pay on Amex, full stop. Does the plat cardholder need to be a driver? Or will being a passenger be good enough for the benefits to apply? Must be named on rental agreement IIRC. O/T Amex Welcome Bonuses – When I log in to my account I see a section on the web page talking about the Welcome Bonus. It gives details of how much more to spend to earn the bonus, and how many points will be credited. On my latest Platinum card, I don’t think I am eligible, but I still see this section on the web page. Does this mean I am eligible, or is it just a standard web page for all users? I left my glasses on a plane and Amex Plat covered it – but they only paid out £22.50 on £145 glasses! Hardly worth the effort of submitting claim. O/T Business is continuing as usual at FlyMaybe. Flight in to BHX delayed 3 times, then cancelled, after 9hrs put on an alternative flight … but bags were not, for all those who were delayed. Surely Virgin’s reputation is going to be ruined unless they rebuild Flybe from the ground up. If that was a domestic, you could have driven from almost anywhere in the UK to Birmingham in that time! I’ve used FlyBe out of SOU maybe 4 or 5 times in the last 18 months, never had a delay more than 30mins. Never had a cancellation. I guess I’m just lucky? I made hotel bookings using the 90,000 Iberia Avios. I’m trying to check in now with the Iberia hotel voucher, but the hotel doesn’t recognise the booking and asked me to contact Iberia! Background: a few month ago, Iberia changed my original booking (Hotel A) to a different hotel (Hotel B) as they claimed that hotel A is closed (although not true – another story). Anyway, I’ve just made three international calls to Iberia Plus, but they are now saying they can only see my original booking (Hotel A) which their hotel team claimed is closed a few month ago via email. I’ve now paid cash at Hotel B for 1 night (the booking is for 5 nights). Hotel A is still open but when I rang them they didn’t have my bookings either. Any advice on what I should do now? All suggestions will be greatly appreciated! Have you not got an email showing the change to the booking from Hotel A to Hotel B? Yes I have the confirmation email also the Hotel B pre-paid voucher, but the Iberia plus agent said he can’t see the change in his system while the hotel B Receptionist can’t find my booking!! I’ve now made 4 costly international calls to Iberia but to no avail! Shocking Iberia customer service. Also you don’t mention what Iberia team is now saying about Hotel A? Sorry to hear that. In any case, if it doesn’t get resolved by the time you check out, you might be able to fight Iberia to reimburse you. I’ve just returned from a USA trip where I used several hotels that were booked thru’ the Iberia Avios promotion. Both times, there was no reference to an Iberia booking – but instead to bookings through Expedia and Booking.com. Seems the hotels only know of this – the Iberia bit is unknown to them (one had no idea who or what Iberia was!!). Might be worth checking with them again – in case your name/booking appears through Expedia or Booking.com? Many thanks Reeferman. I’ll try your suggestion now. What concerns me is that there are no bookings under my name at all and it seems that all booked guests have now checked in (according to the receptionist). Thank you so much for the information Reeferman! The hotel receptionist phoned her manager (who is out of office at the moment) to check Expedia booking and it appears that our names are in his guests list. The manager will be back tomorrow to contact Expedia about the booking (he didn’t give a reason why he needs to contact Expedia if the booking is confirmed). Thanks again! That’s brilliant – pleased it worked out. I used the 90K Iberia Avios for two hotel bookings. The one in Barcelona took ages to check-in, from memory something like 30 minutes, the reception were on the phone to their head office for most of this time. The second one was for a Novotel in Berlin this last weekend which was fine. Anyone having problems paying IHG card with Revolut? It has been working fine previously but the last couple of days I’m getting payment not successfull errors. Have you given it a break for a few days? Pretty low limits allowed. Fuel surcharges are a rip off. Use a few Avios to reduce the price. You will earn a few more Avios and TP. How much is the flexible WT ticket which would be the proper comparison? Exactly. That’s one reason you would use Avios vs cash or at last min when cash is sky high. I don’t understand this sentence. Is everyone in a W hotel always in a rush to get somewhere? Are Editions famously relaxed? they’re a bit louder and more in your face. The last line of your quote and 9(ii) above says to me we don’t need to do anything. If there is no credit in your account the Rocket Pack cannot auto-renew. Just caught your reply on previous page, thanks.